Shuffle the cards and place them in a deck face down next to the board. Draw six cards and place them face up in a row along the top of the board. Each player takes a set of one color of cubes (14 armies) and discs (3 cities). 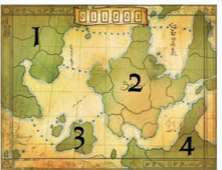 Each player places 3 armies on the starting region on the board. 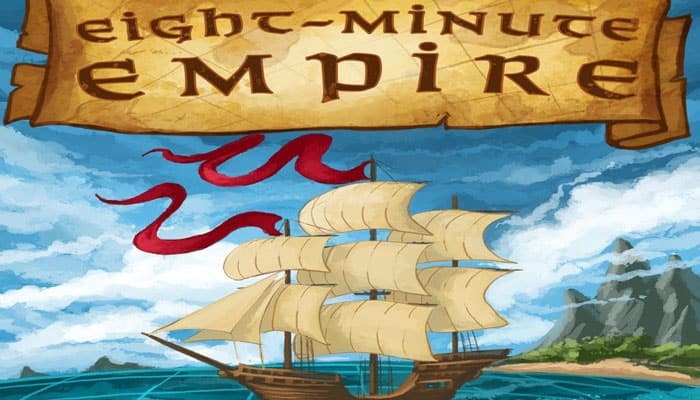 If playing with 2 players, each player takes turns placing one army at a time of a third, non-player color in any region on the board until ten armies have been placed. Place the coin tokens in a pile next to the board. This is the supply. Each player takes 8 coins if playing with five players, 9 coins if playing with four players, 11 coins with three, and 14 coins with two. 1. Players bid to see who will choose the first player. Each player picks up his coins and secretly chooses a number to bid by placing them in a closed fist and holding the fist out over the game board. When all players are ready, all players reveal the amount they have chosen to bid at the same time. The player who bids the most coins wins the bid and puts the coins he bid in the supply. Other players do not pay coins if they lost the bid. If the bids are tied for most, the youngest player wins the bid and pays his coins. If all bids are zero, the youngest player wins the bid. There is only one bid per game. The winner of the bid chooses who will be first player. He must pay the appropriate coin cost for the card depending on where it is in the row (this cost is listed at the top of the board). From left to right, these are the coin costs of the cards: 0, 1, 1, 2, 2, and 3. For example, if a player selected the third card from the left, he would pay one coin. This action is only for land movement and does not allow you to cross the dotted lines over oceans. Same as "Move Armies" described above, but you may also move between two regions connected by a dotted line (over water) as if they were adjacent. You may remove an army from the board belonging to any player from any location. If there are two different actions on the card with an "or" between them, you may choose which action to perform. If there are two different actions on the card with an "and" between them, you may perform both actions. 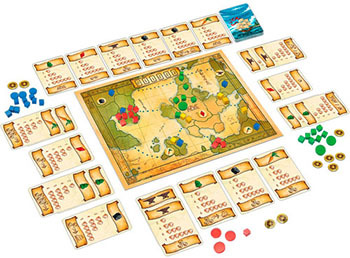 Goods: A player gains victory points for his sets of goods. Players can now decide where to place their "Wild" cards. "Wild" goods cards can be added to any goods cards a player already owns for one extra of that good per "Wild" card. The amount of victory points each good is worth depends on how many cards of that good he has and is listed in the middle of the card in four amounts. For example, Crystals are worth 1 point for one card, 2 for two cards, 3 for three cards, and 5 for four cards. 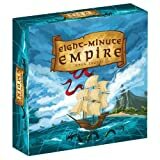 The player who has the most victory points from regions, continents, and goods has the most powerful empire and is the winner! If players are tied, the player with the most coins wins. If still tied, the player with the most armies on the board wins. If still tied, the player with the most controlled regions wins. 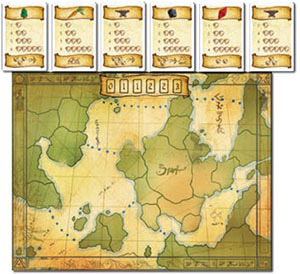 Goods Tokens: During game setup, randomly place one of the goods tokens on each region on the board with a triangle. 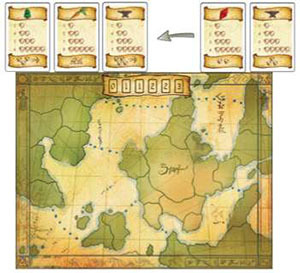 The player who controls a region with a good token in it has one more of the depicted good.